If you decide to buy a Dachshund puppy, then it’s also a good idea to go for a breeder that many people trust, such as CT Breeder. However, before you decide to buy one at CT Breeder, it may help first to read the article below so that you can make an informed decision. Dachshunds are so small that you can fit them in your pocket. Or your purse, even! The typical height of a dachshund is also 5-7 inches. This is measured all through its withers. During the last 19th century, these dogs were the most popular among the Germans. Germans wanted smaller dogs for hunting. They didn’t want something that hindered their hunting activities, which is the reason the petite size of Doxies appealed to them. On that note, there are three types of classifications of dachshund puppies according to their coats. These three types include the short-haired, which are called “smooth”; the long-haired; and the wire-haired. The Wire-haired dachshunds are usually the most common type in Germany, but is rare in the United States. The Longhaired dachshunds that you can find have the silky coat on their bodies, with short featherings on their ears and legs. Miniature Doxies have a body shape that’s low to ground. This means that they have long bodies but short legs This gives the dachshund a more robust foundation. When their muscles contract, you may notice its skin to stretch out. That’s another trait you should look out for. You can also see a lot of wrinkling going on in their bodies. Another thing that you should learn about miniature type dachshund dogs is that they have a keen nose. This gives them advantage over other types. This makes them more appealing to dog owners, as it strikes the dog owner as cute. It may also be useful for you to know that there is only one size of miniature dachshund in United States. In other countries, such as Germany, you have two types. The first one would be the miniature or zwerg size. The second one would be the kitchen size, which is rabbit size. In picking the right type, you should also remember that Doxiess can be born in different patterns and colors. One of the most common colors for these types is red, which usually comes in single color. Some of them include dachshunds with various prints, including dapple, blue and piebald. There are dachshunds, too, that are cream and red-colored in their coat. 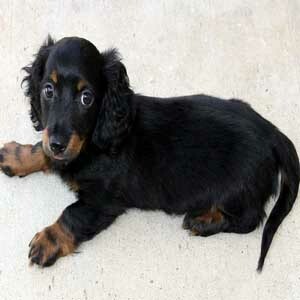 You can also get Dachsies that have tan tints, which combine with chocolate, black, blue or Isabella. There is also what is called a wildboar color in wirehaired dogs. The usual patterns, on the other hand, that can be seen on dachshunds include sable, piebald, and brindle. Another important trivia, according to Dachshund Club of America (DCA) and the American Kennel Club (ADC) is that the piebald pattern and the double-merle pattern in these dogs are nonstandard, but despite that, these types still end up winning in conformation rings. Most miniature Doxies are ecstatic and energetic. They’re also independent and high-spirited. They’re also known for being intelligent. They can even think on their own! Dachshunds are some of the easiest to maintain. Miniature dachshunds can even live comfortably both in urban and rural settings. You don’t have to prepare a lot for them. You don’t even have to buy expensive dog sheds and shelters for them. Because these dogs are very active, you can go with them during your workouts and not worry too much about them. Which means these dogs are relatively low maintenance. Dachshunds live for up to 14 years. Remember that these dogs are prone to IVDD. This acronym means Intervertebral Disc Disease. When your dog is hit by this, the disease usually lasts from 3 to 6 years. Some of the worst complications when your dog has this disease is paralysis or loss of control of the dog’s bowel movements. There may also be urinary bladder issues. There’s also a higher risk of complications. So it is important to talk to your veterinarian on how to prevent diseases such as this from happening to your Doxie. If you’re looking for a Dachshund from a trusted dog breeder that only has ethical practices in breeding, then CT Breeder should be one of your top choices. If you’re interested in purchasing a Doxie puppy, turn to CT Breeder and ask about their Dachshund puppies for sale – (203) 920-4950.